Just like Error 0xc000007b, we may find some unspecific errors on Windows 10 which can stop us completing certain actions. Error 0x80004005 is one of them which pop-ups on the screen on the failure of the installation of Windows updates. Moreover, you may find this error while accessing the Shared Folders, Drives, Virtual Machines and other such files. Since there are many files in your system related to this error, before going through the ways to fix it you have to know the reason behind it and where it is occurring. 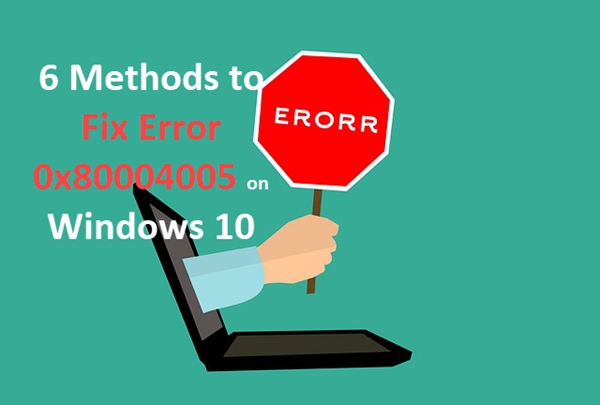 In this article, you will read about different methods to troubleshoot and fix error 0x80004005 along with the causes. Cause of the error code 0x80004005 is not simply mentioned in either error message or Microsoft Book. You will be shown “Unspecified error” as its description. So, you can’t get the actual reason behind this error. But, as specified from Microsoft, error 0x80004005 occurs because of two reasons. However, it’s difficult to recognize the cause as the working system of the computer is complex. There can be two reasons due to which this error will pop-up on your device. If the installation of the Windows OS is interfered or obstructed by any of your antivirus programs or third-party utility, then you will get this error. Or, the file required by the WPA (Windows Product Activation) is modified, missing, damaged or changed, then also this error will show up on your computer’s screen. Pro tips: In case you lose important files due to critical errors on Windows computer, just utilize Jihosoft File Recovery to recover files from Windows 10. Windows updates come with many advanced and exciting features. However, you may get some error which can annoy you. To get rid of one of such errors i.e., 0x80004005, you can go for these mentioned ways and methods. These ways are completely tested and verified. So, you need not to worry as these methods will not create any additional problem with your computer system. If you don’t get your issue fixed with one way then go for another one. As mentioned earlier, it is difficult to analyze and identify the cause after the issue. So, you need to go for all the methods until the error is removed and you can access your system without any error. More often than not, the error could be caused due to compatibility issue, and can be easily fixed by installing the updates released by Microsoft. Click Start menu, go to Settings > Update & security > Check for updates. Install available updates according to the instruction. Restart your Windows 10 computer and see if the error has been fixed. This method is not necessarily the ultimate solution, but it won’t take much effort to update Windows 10. Just make sure you have never disabled Windows 10 update. If you are finding this error with VirtualBox installed, then you need to delete the registry key of VirtualBox from Windows computer. Because of the registry key presence, the computer shows an error. Follow these steps to delete the registry key. Press the Windows key and “R” key simultaneously to open the Run dialog box. Now, on the open search bar, type “regedit” and then click on “OK”. Delete this registry key and then check whether the issue is resolved or not. If the issue is not fixed, then you need to uninstall the antivirus present on your computer. Check again and then reinstall the antivirus. Even after installation, if you are capable to resolve the issue, then use AVG or Security Essentials in place of your antivirus. Windows 10 provides many verified troubleshooting tools which can be used for removing the error. Since one can find this error while updating the Windows system, so Windows Update Troubleshooter can be beneficial for fixing the error 0x80004005. Using the Windows Update Troubleshooter tool, you can check the updates, activate new services and scan the errors. 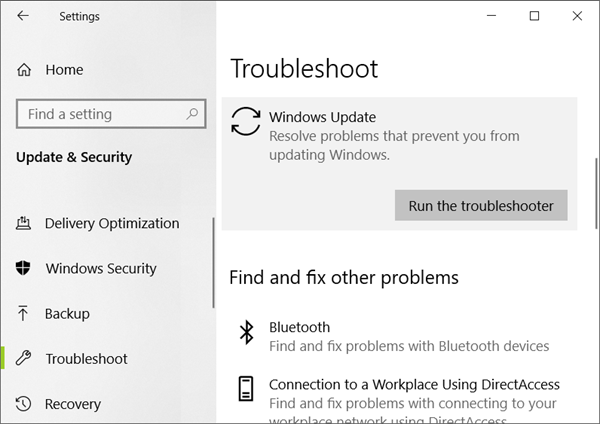 Follow these steps to run the Windows Update Troubleshooter tool. Press Windows and ‘I’ key simultaneously. The Settings window will open on the screen. Select “Update & Security” and then click on “Troubleshoot > Windows Update > Run the troubleshooter”. Now, follow the prompted instructions given on screen and proceed until the process is finished. Restart the computer and then check for the existence of error. If you are facing an issue while accessing a Shared Drive or Folder, then you can create a LocalAccountTokenFilterPolicy Value using regedit to fix the error. To do so, follow these steps. Press Windows key and “R” key simultaneously. The Run dialog box will open on your screen. On the Open bar, type “regedit” and then click on “Ok”. Now, create a LocalAccountTokenFilterPolicy Value for your system. Go for DWORD for the 32-bit system and QWORD for a 64-bit system. For both the system, make the numeric value equals to “1” and then click on “OK” to save the changes. Restart your PC and check the error existence by accessing the Shared Files or Folder. If you are finding error even after using the regedit, then follow these simple steps. Press the Windows + R key to open the Run dialog box. Enter “hdwwiz.cpl” in the Open bar for opening Device Manager window on the screen. From the menu bar, click on View > Show hidden devices. If you find Microsoft 6to4 adapters, then delete them. To delete it, right-click on it and select “Remove Device”. Restart the device and then see if the error 0x80004005 has disappeared. While opening or extracting .zip or .rar files if you are getting a 0x80004005 error, then you can easily fix it following methods. If you are not capable to open any .zip or .rar files then you can use another extractor utility like 7zip to extract the file. The third-party security tools don’t let the user open the extracting files by blocking its extraction. This only happens in the condition when you use any third-party antivirus or security software in place of default Windows security suite. In such a case, you can extract the zipped files by disabling the real-time protection of the third-party anti-virus. Now, restart the PC and check whether the issue persists or not. If it is not yet resolved then you can go for another security suite or the in-built security system. If the above-mentioned methods have not worked for you to fix the issue then you can finally fix it by this one. In the elevated Command Prompt, the re-registration of Dynamic Link Libraries is beneficent to solve the issue. Go for these steps to re-register jscript.dll and vbscript.dll. Press the Windows button and press “R” key. A Run dialog box will appear on the screen. Type “cmd” and then press “Ctrl + Shift + Enter” to proceed. At the User Account Control (UAC) prompt, click on “Yes”. This will open the Command Prompt as administrator. Now, type “regsvr32 jscript.dll” and press Enter. Again, type “regsvr32 vbscript.dll” and press Enter. This will re-register these DLLs. Now, boot up your PC and open or extract .zip or .rar files and check for the error. If you are finding the error while opening a session on a Virtual Machine, then you can fix it with following steps. Go to your Network Center and select “Change adapter settings”. If you see that “VirtualBox NDIS6 Bridget Networking Driver” is disabled, then enable it using toggle button. Now, restart the computer and check the error. If the error is not fixed then make sure that “VirtualBox NDIS6 Bridget Networking Driver” is enabled for your every network adapter (WiFi, Ethernet, etc.) and then uncheck the NDIS6. Again, restart your PC and check the error. These are the possible methods for solving 0x80004005 error on a Windows computer. You may try these methods one by one until the problem is fixed. If you have anything to ask or share, please put your queries below in the comments section.